Is it still a recipe if it's not totally from scratch? I feel super mommish when I put my Domestic Julie hat on and make yummy food for other people. Usually this takes the form of dessert. 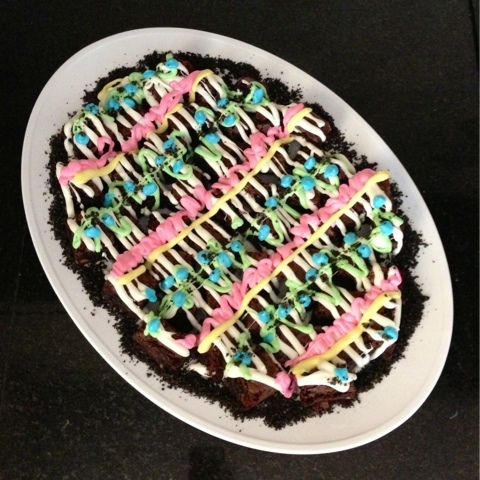 And I especially enjoy decorating food. 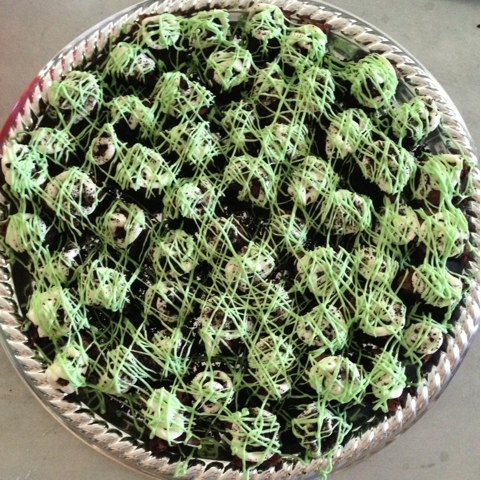 I've played with making mint brownies three times in the last month (first St Patricks's Day, then a church potluck, and today for Easter). I've experimented using on my own taste buds and different tips I found on the internet, and have come up with this little concoction that I think is one if the greatest makeshift dessert creations I have ever had. Cooking spray... or whatever you use to grease a pan. 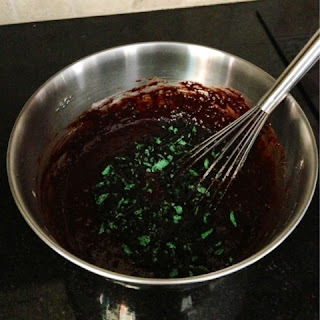 Preheat oven, grease baking dish (I used glass), and prepare the brownie mix per the instructions on the box. 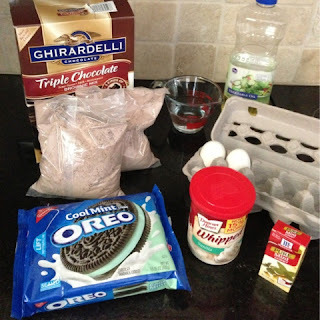 Chop up 8-9 of the Oreos so there are different size small chunks. 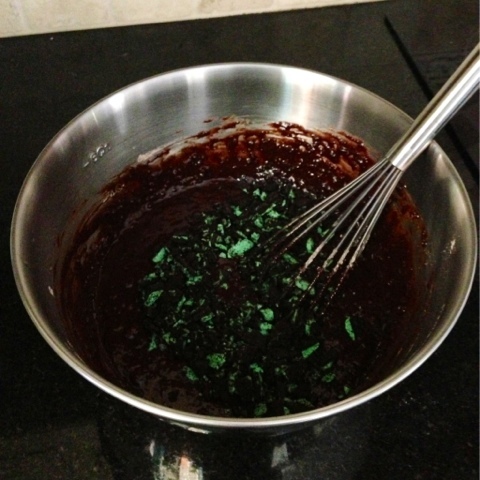 Stir the chunks into the brownie mix until it’s even. You can line the bottom of the pan with additional Oreos if you want. 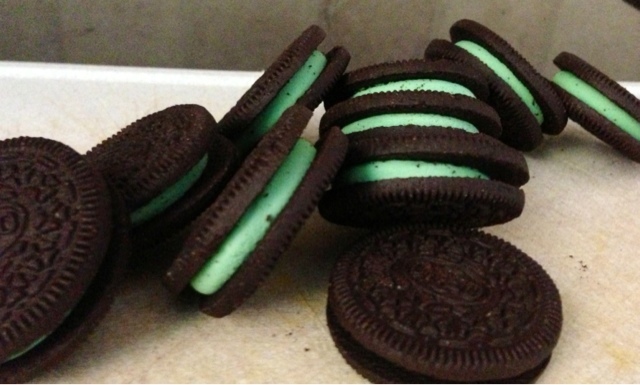 If you'll be decorating, save some Oreos for that too! Maybe chop them up really small for dusting after you've frosted them. 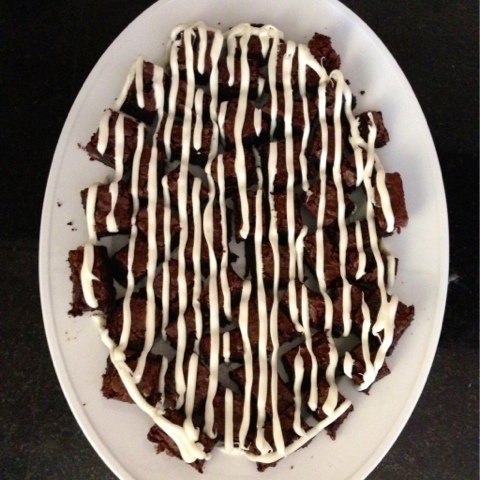 Pour the brownie mix into the pan and bake the brownies per the instructions on the box (50-55 min at 325 degrees). Put all the frosting from the container in a small mixing bowl. Add a splash of mint extract -- about 2 tsp -- and stir well. Keep adding more mint 'to taste'. 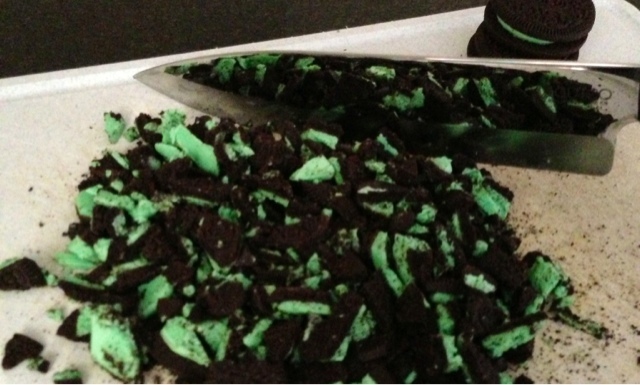 Separate into bowls and add food coloring if you want different colors. Cut up the brownies into large bite size (about 48 pieces) and arrange them on the serving plate before frosting them. I frosted them by putting the frosting in Ziploc bags, cutting a small hole in the corner and squeezing... poor man's cake decorating! 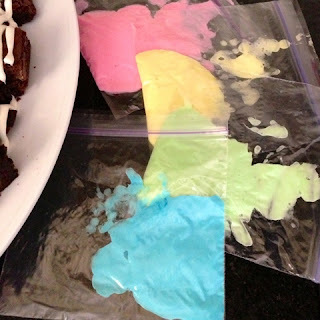 I think using the bag-technique keeps the brownies in better shape than spreading the frosting with a knife across the top, but you can really frost however you want! 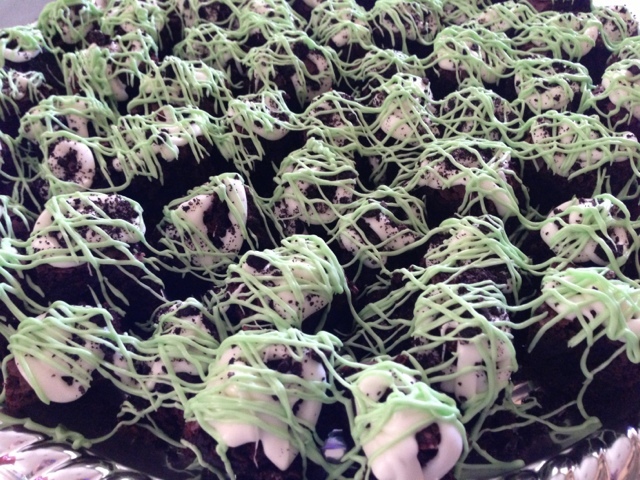 You can see here, one time I did a green and white drizzle, and today I turned a plate of them into a giant Easter Egg. Cut brownies with a disposable plastic knife instead of a sharp metal one. It's much cleaner. Thanks random person on the internet. Keep them refrigerated for a true "cool mint" experience. The frosting tastes better if it hardens a bit, I think. 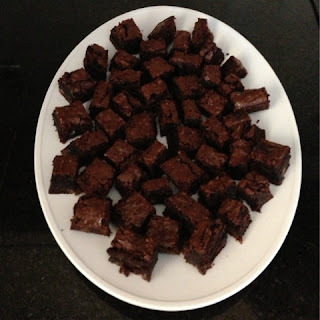 After frosting the bite-size brownies, put toothpicks in each for easier serving at a party. And now I'm craving brownies. :) Those look great Julie!